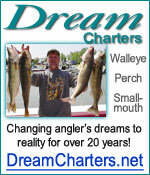 Any business can place a banner advertisement on the left, right or bottom of each page of our website. Last year we had over 170,000 hits generated from nearly 50,000 website visitors. 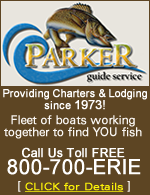 Our demographics indicated that these visitors were searching for Lake Erie Fishing Charters. The banners have tracking code which provides the number of times your banner has been clicked. We provide a password protected area where you may see the tracked visitor clicks sent from our site to yours.